Transistors and thyristors are both semiconductor devices which have numerous applications in electric circuits. The main difference between transistor and thyristor is that a transistor has three layers of semiconductors, whereas a thyristor has four layers of semiconductors. Sometimes, thyristors are referred to as silicon controlled rectifiers (SCRs). Transistors are semiconductor devices that can act as amplifiers or switches in electric circuits. A transistor consists of three doped semiconductors. Major types of transistors include bipolar junction transistors (BJTs) and field effect transistors (FETs) and insulated gate bipolar transistors (IGBTs). We have discussed how these transistors work in the articles comparing the difference between BJTs and FETs and the difference between IGBTs and MOSFETs. Transistors have three terminals. By controlling the voltage applied to one of the terminals, it is possible to control the current through the other two terminals of these devices. You can think of a thyristor as two transistors working together. On the right: the symbol for a thyristor. Reverse blocking mode: In this setup, the anode is given a more negative potential than the cathode. This means that the junctions J1 and J3 are reverse biased while the junction J2 is forward biased. In this mode, a current cannot flow through the thyristor. Forward blocking mode: In this setup, the anode is given a more positive potential than the cathode. Here, J1 and J3 are forward biased, while J2 is in reverse bias. A current still cannot flow through the thyristor. Forward conducting mode: In this setup, the anode and the cathode are connected as in the forward blocking mode. However, there is now a current flowing through the thyristor. This could have been achieved by two methods: If the forward potential difference between the anode and cathode was so large, the junction J2 would undergo breakdown, allowing a current to flow across it. If the potential difference is not large enough for breakdown to occur, forward conduction could also have been achieved by sending a forward current through the gate. The current vs. voltage characteristic curve for a thyristor. The curve labelled refers to the case when there is no applied gate current. Here, the forward voltage must reach the breakdown value of before it can start to conduct a significant current. The curve labelled shows that when there is some gate current, a current can start flowing through the thyristor at a lower forward voltage. Note that the current values labelled and refer to the latching current and holding current respectively. 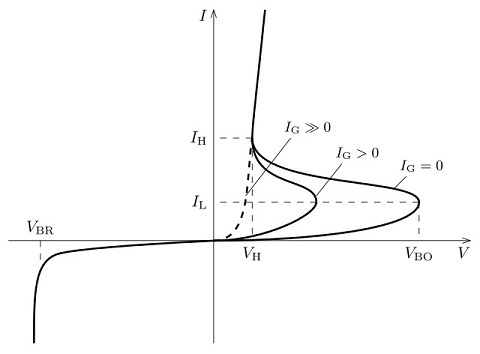 The curves show that once latching current is achieved, the current rises rapidly and that if the current falls to , it drops off (the dashed curve). Transistors consist of three layers of semiconductors. Thyristors consist of four layers of semiconductors. Thyristors can be used in circuits delivering larger amounts of power compared to transistors. Transistors can be used as switches or amplifiers. Thyristors can be used as switches, but not as amplifiers. In transistors, a continuous input is required to maintain a forward current. In thyristors, a pulse can get the forward current flowing, and this current will continue to flow as long as it does not fall below a threshold value, even when there is no longer an input current.